During the week I was playing around with some techniques and I tried the straw technique, where you basically blow re-inker around on glossy paper using a straw. For my piece, I used this week's Splitcoaststampers color challenge, which was to use River Rock; Baja Breeze and Not Quite Navy. It's hard to tell but there is some River Rock on this piece LOL. To add a little something to the piece, I also used the Faux Mother of Pearl technique and scrunched some plastic wrap and dabbed on some Champagne Mist Shimmer Paint, which you can just see at the bottom left of the long panel. 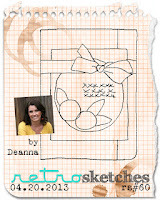 I also used the sketch challenge at Freshly Made Sketches and the Just Add Ink challenge to Just Add a background. I figure my straw technique pieces count as background. Pretty much everything on this card is retired or about to be retired (except Basic Black cardstock)! I pulled out Set Sail as I thought a nautical theme would work with the background pieces. The card base is stamped with a really old background stamp called Old World Map. The little anchor is from the Happy Whale clearlits die and I have to confess that the anchor was the only reason I bought the die. The sailor's knot was tied after Googling how to do it because it's been years since I last tied this knot. I used the long retired Rope Twine which really adds to the nautical theme (and to the bulkiness of the card)! Apologies to Allisa the sketch designer, but I couldn't make the horizontal panel work, so I decided to leave it off. This will be a quick post because I've just realised I have 1 hour before the linky tool closes on this week's Retro Sketch challenge. For my interpretation of the sketch, I used a paper doily as the circular feature. Because I couldn't get the bow to work horizontally, I went with a vertical look instead. Hard to see in the photo, but I dry embossed the Old Olive strip with the Needlepoint Border EF. The roses were made using a 1 3/4" circle punch. Today is the last day of my week's holiday. I haven't been in my stamp room as often as I would have liked, but have had a good week with my boys. Here's a card I made using the sketch challenge at Hand Stamped Sentiments, the Anything Sizzix challenge at SUO Challenges and the color challenge at Color Throwdown. My Big Shot got quite the workout with this card. 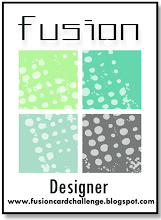 I used the Honeycomb EF; the Scribble Swirl Sizzlet; the Floral Fusion Sizzlet and the large Scallops Framelit. 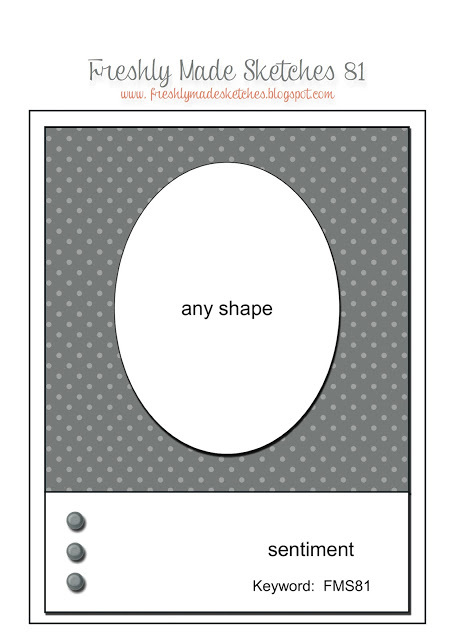 To mimic the oval shape in the sketch, I paper pierced three ovals. The DSP comes from a really old pack called Spring Showers. When I look at the grunged sheets in this pack, I realise Stampin' Up! was ahead of their time with this paper! Today was one of those days where everything stampy turned out badly! I had several attempts this morning at different techniques and finally gave up in disgust at the results! So finally I gave up on the techniques and made a CAS card - about as simple as they come! I used the sketch from Nacho Average Challenge and some current and returning colors to make this very simple, but bright and cheerful card. I punched Itty Bitty Butterflies out of Soft Sky; Pear Pizzazz; Calypso Coral; Perfect Plum and Island Indigo cardstock. I cut a tone-on-tone banner and adhered that using dimensionals. Then I positioned the butterflies across the card. Three little rhinestone jewels on each butterfly and a simple sentiment finish the card. After masking off both sides of the card base, I sponged River Rock ink on the bottom half of the exposed strip. Then I sponged Melon Mambo along the whole strip and Elegant Eggplant on the top. I went over and over with the different colors until I got a gradation of color that I was happy with. A simple sentiment stamped in black finished off the card. This is my second post today. Scroll down for my Apothecary Art card. 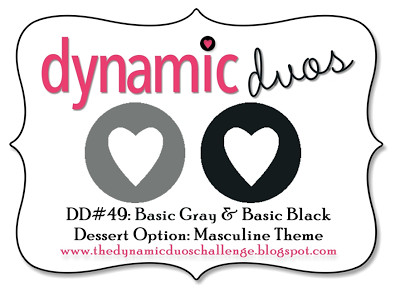 The color challenge at Dynamic Duos this week is Basic Black and Basic Gray, with a dessert option of a masculine card. I thought these colors would work nicely with the sketch challenge at Sketch Frenzy Friday, which was a color-blocking card. I dug out some old retired Halloween paper, called Ghostly Greetings and an old retired set called Celebrate Everything. Some not-so-old but still retired ribbon rounded out the card. LOL it looks like this card has been photographed in B&W, but I can assure you it's color! I white-embossed the word "celebrate" onto one of the pieces of DSP. The dots on the bottom right are part of the pattern. 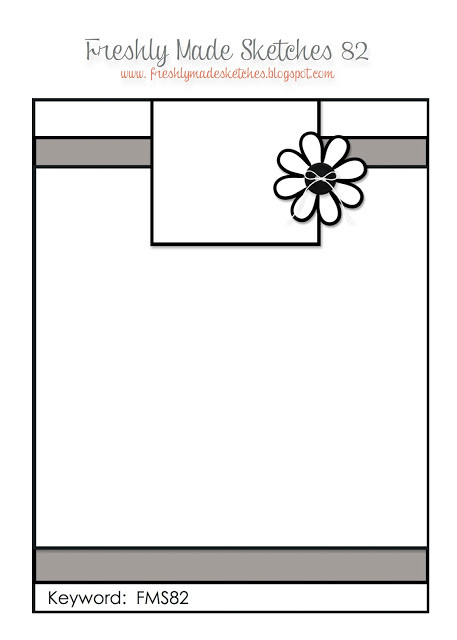 The scalloped border was paper-pierced and the soda pop top is a white-embossed bee on Basic Black cardstock. 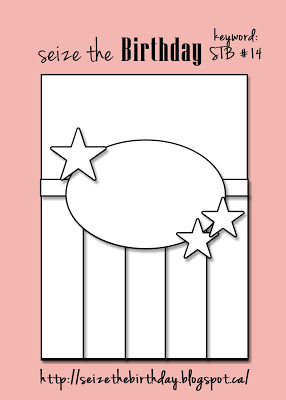 Today I combined the Friday Mashup challenge with the sketch challenge at Seize the Birthday to come up with this card. 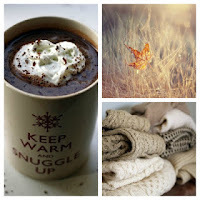 I also happened to use a new technique called Whitewash which I saw on Deb Valder's blog. This technique is similar to the color wash technique, but I love the idea of using it on Whisper White cardstock, so you can color without pilling. So, because this is the first time I've done this technique, I'm also linking to the Just Add Ink challenge to try a new technique. I black embossed the image from Apothecary Art onto Whisper White cardstock, then colored using Whisper White craft ink and a blender pen. Once that dried, I colored with Perfect Plum; Wisteria Wonder and Sahara Sand markers, using the technique on Deb's video. Once that was done, I did something I very rarely do and glittered the image! The ribbon and flower trim were dyed using Perfect Plum ink, water and rubbing alcohol, then dried in the microwave. 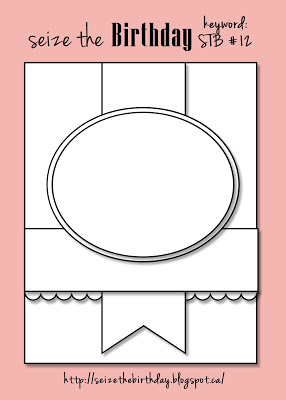 Create a card using the colors "Sahara Sand, Perfect Plum & Wisteria Wonder". 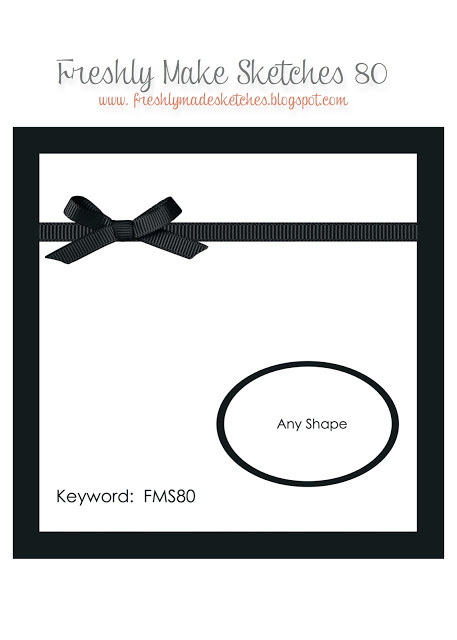 Create a card and "Mail or Deliver it to Someone Special". 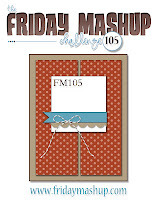 Or Mash it Up and create a card with "Sahara Sand, Perfect Plum, Wisteria Wonder & Mail or Deliver it to someone special". I'm pleased to say my long, long work week is over. The bulk of the budgets for the 2013-14 year are done and now I have a week off work because my boys are off on school holidays. Initially I didn't even feel like stamping today, but I made myself go into my craft room and I managed to churn out a couple of cards - one of which I even like LOL. Here's the first card I made (and the one I like). 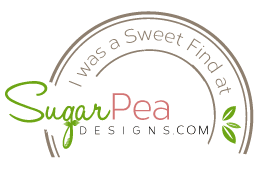 When I first saw the sketch at Freshly Made Sketches, I wasn't sure how I was going to make the rectangle at the top work. 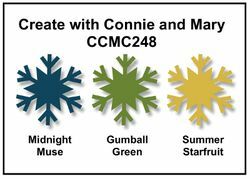 But then I decided to use the colors from Create with Connie & Mary and it all seemed to fall into place. Initially, I had the white panel as a flag, but then I rounded the bottom corner using my 2 1/2" circle punch and it looked much better. The flower was made using 5 scallop circles separated using the faux suede technique then topped off with a Summer Starfruit brad from the Pop Up Posies kit. DSP from the Print Poetry stack provides a subtle background. 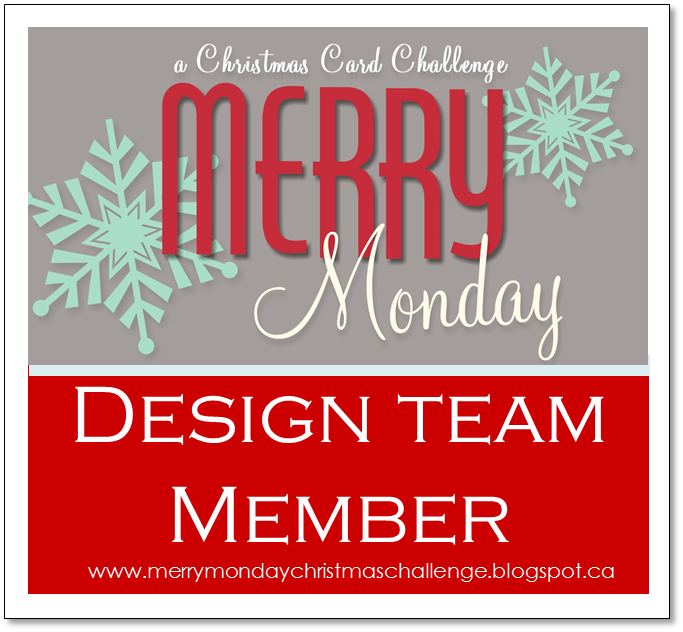 Edited to Add: This card was a top pick at Create with Connie & Mary and a Perfect Princess card at Freshly Made Sketches. 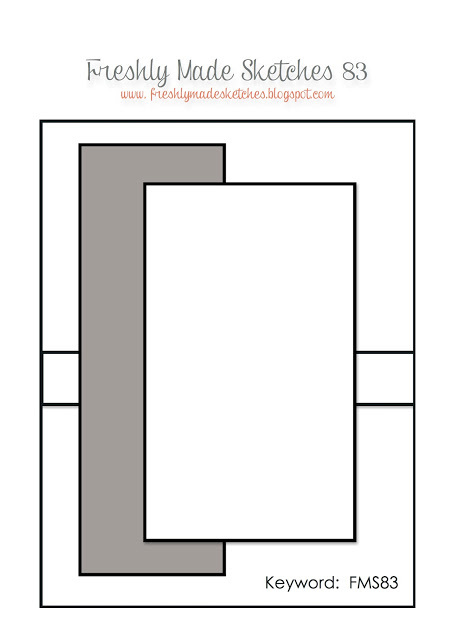 While I had my Secret Garden set and framelits out the other day, I made another card - this time for the sketch/birthday challenge at Friday Mashup and the monochromatic challenge at SUO Challenges. I've been really busy at work as it's budget time, so I'm squeezing this post in while I have my morning coffee before heading in to do another long day crunching numbers. I white-embossed various flowers onto the Pool Party script DSP from the paper stacks, then cut them out with the framelits. They were mounted onto Whisper White using dimensionals, which itself was mounted onto Whisper White using dimensionals. The background is more script DSP, this time Island Indigo. The little soda pop top was stamped using Collage Curios and coated in Crystal Effects and left to dry. When it was dry, I stuck a tiny little rhinestone on it. I don't know whether it's because my Crystal Effects is old (circa 2007) but my wee embellishment looks a bit cloudy. Next time I might try clear embossing several layers to see if that looks clearer. 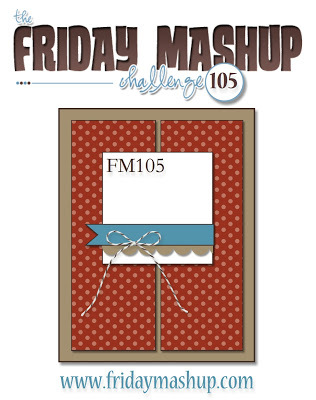 Edited to Add: This card was chosen for a Glamette award at Friday Mashup! I combined the sketch challenge at Freshly Made Sketches with the color challenge at Hand Stamped Sentiments to come up with this card. 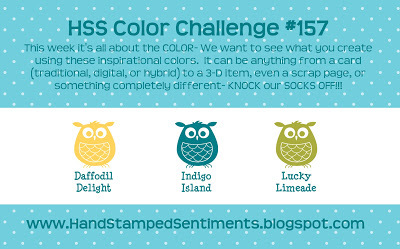 I haven't had a chance to play with the HSS challenges for what seems like forever, so it was good to get to use these gorgeous colors together. I white-embossed several flowers from Secret Garden onto Crumb Cake cardstock. I then "colored" them in with white ink and over-colored with Daffodil Delight and Island Indigo ink. (I still don't know what this technique is called, so if anyone knows it's name, please let me know LOL). 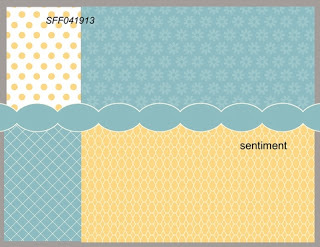 Edited to Add: This card was chosen as an HSS Artist Pick card this week. I have an unexpected day off work today due to my youngest having an Open Day at what will be his new school next year. That only lasted half a day so I had the afternoon to stamp in peace! My idea when I started this card was to have a white base with Pool Party as the main color and just a hint of Cherry Cobbler, but when I laid down the DSP on top of the base, it just seemed to work, so Cherry Cobbler is the star of this show! 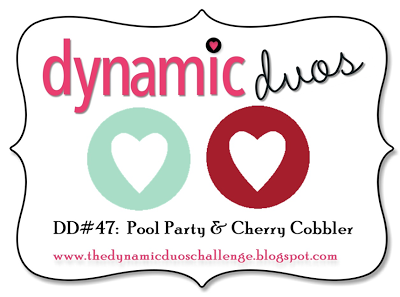 Both Pool Party pieces are textured - the banner using the Cloudy Day EF and the horizontal strip using Fancy Fan EF. 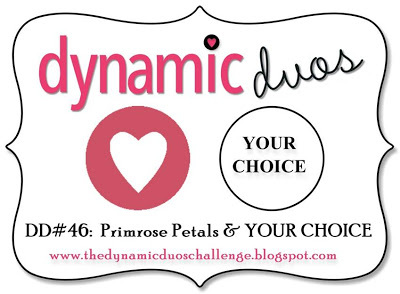 Edited to Add: This card was picked as a Dynamic Darling at Dynamic Duos this week. This is my second post today. Scroll down to see the birthday card I made for my little niece. My dad is turning 80 next week - and a young-looking 80 he is! Many years ago he came to pick me up after school one day and one of my friends asked if he was my brother! At that time, I would have been about 12 and he would have been in his 40's! I can only hope I age as well as my parents! The card I made for him uses The Open Sea and I've used a few challenges - the sketch challenge at Paper Craft Crew Challenges; the inspiration photo at Just Add Ink, which I interpreted as neutrals with a little pop of color; and the Creative Crew challenge to make a masculine card - preferably using a non-masculine set. Well, I made the masculine card, but I used a pretty masculine set to make it, so maybe I only get half a point for this one LOL. I used Nautical Expedition DSP, distressed and sponged with Crumb Cake ink then layered onto Early Espresso cardstock, which was also distressed and sponged. I inked up the ship using markers, then after stamping, I masked the ship and stamped the globe in Crumb Cake ink. I also distressed and sponged this layer. The "80" was die cut and sponged with Cherry Cobbler ink. 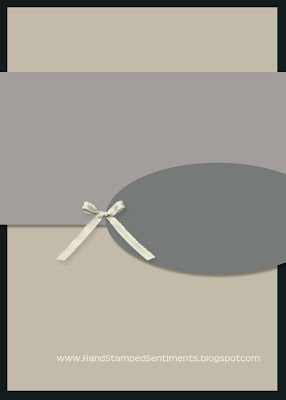 Linen thread; neutrals brads and a Naturals Designer Button finish of the card. Edited to Add: This card was chosen as a Featured Artisan card at Paper Craft Crew this week. It's my niece's third birthday party tomorrow so I thought I'd better get a card made for her. Roisin (pronounced Ro-sheen) is a wee character and the youngest of my nieces and nephews. 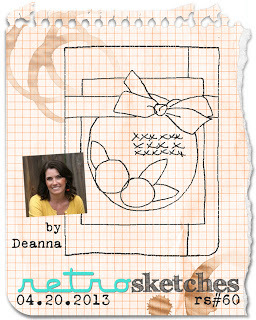 I used the colors from this week's challenge at Create with Connie & Mary and the sketch from Freshly Made Sketches. 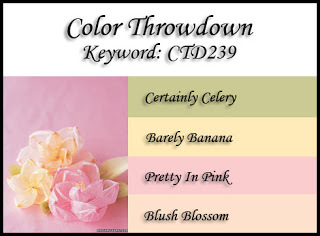 I'm also going to use this for this month's Creative Crew challenge to use the 2011-13 In Colors with the challenge being to use our least favorite. 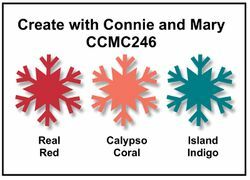 My least favorite is hands-down Wisteria Wonder, but Calypso Coral is a color I like but struggle to make work, so I'm choosing that. 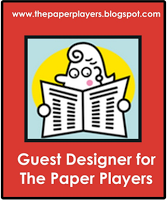 Speaking of the Creative Crew at Splitcoaststampers, I've been invited to join the Crew for the May-August period, which is pretty awesome! 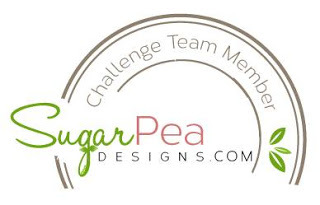 Keep an eye out on 1st May for my first challenge cards. This card is pretty self-explanatory. It's 5" square. 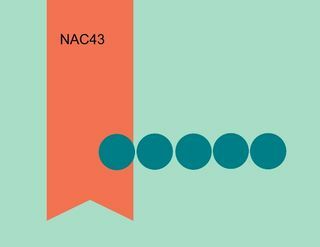 I punched three circles out of the challenge colors and stuck them together. On top of the Island Indigo circle, I adhered a die-cut "3" which I then colored used Dazzling Details. As a rare treat, I even decorated the inside of the card as well using stamps from Create a Cupcake! Today is the last day of my 4-day Easter Weekend and it's back to work tomorrow! 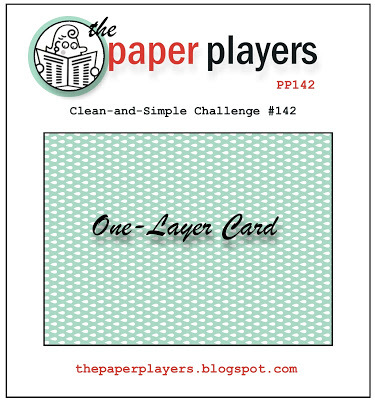 I'm trying to get in a few more cards before real life intervenes so here is a card which covers several challenges. 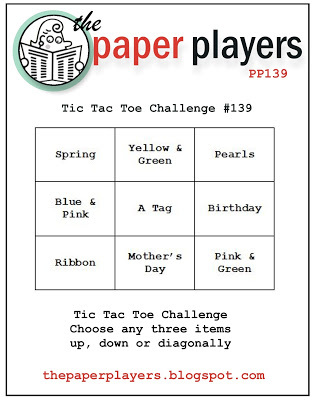 The sketch comes from Fab Friday, the colors from Dynamic Duos and the tic-tac-toe challenge at Paper Players. 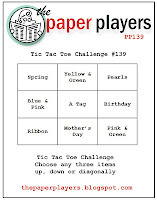 I chose the pink/green, pearls and birthday squares in the tic-tac-toe grid. The green I used with Primrose Petals is Old Olive. The leaves, flowers and banner are all raised up on dimensionals and it's all offset against a Very Vanilla background. Edited to Add: This card was chosen for an Honorable Mention at Dynamic Duos this week.